The primary armament carried by Russian nuclear submarines takes its name from an weapon that has a history stretching back thousands of years and a special symbolism in Russia. In Soviet times, individual Russian nuclear-powered strategic submarines were always named after Russian cities, while the class or series traditionally took names of denizens of the sea: “Akula” (shark), “Kalmar” (squid) and “Delfin” (dolphin). 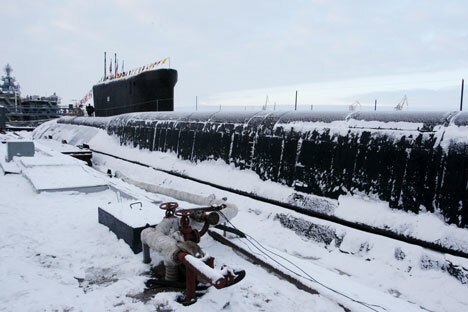 However, when the new “Borei” (the personification of the north wind in Greek mythology) submarine class was commissioned in 1996, it was decided to break with long-standing tradition and to use instead the names of great Russian princes, such as Yury Dolgoruky. The name of the primary weapon of these vessels, the new dry-fuel rocket Bulava (“mace”) also took on a symbolic meaning. A word of Slavonic origin, meaning a bump or knob, the bulava is a steel sidearm in the form of a mace capped with heavy lump. The weapon originated in the Roman Empire and the Orient and was later widely adopted in ancient Rus. Despite its apparent crudity, this weapon became the symbol of power in ancient Rus, Poland, Turkey and the Cossack Hetmanate in what is now Ukraine. Its phallic associations aside, this weapon was also a symbol of the master of life and death among the Celts, as well as being associated with Hercules and Melpomene in Greco-Roman culture, while it epitomized penance before the highest deity among Semitic peoples. And what better name could there be for a missile carrying nuclear warheads? The bulava thus had all the prerequisites to transform itself from club to officer’s baton to a missile tasked with ensuring global nuclear deterrence. It was nomads who first brought the mace to Russia from the south-east around the 11th century, and it quickly found popularity as a cheap, widely available weapon among peasants and townsmen in the 12th and 13th centuries. Maces were produced mainly in Kiev and southern Russian towns, and it is in these areas that almost 90 per cent of the archaeological finds of the weapon have been made. The bulava was traditionally made in the form of cubes with cut-off corners, which created something akin to studs and pointed protuberances - essential for smashing heavy armor. Russian craftsmen would cast the head of the weapon from wax or clay and then pour bronze into the mold to create a hollow shell, which was then filled with lead. More elaborate examples were trimmed with gold, silver and even precious stones. And like its medieval forbear, the 20th-century rocket-fueled Bulava was designed to pierce armor in the form of a staggered missile defence shield. The missile was designed for combination with land-based “Topol-M” rockets produced by the Moscow Institute of Thermal Technology. In the Middle Ages, the bulava hung from a person’s belt as an auxiliary weapon capable of administering a swift, unexpected blow to the helmet, since the most powerful strike came from a low trajectory. The nuclear Bulava is, however, a weapon of deterrence. According to the calculations of the military command, it should restore the disbalance of power in the Russian nuclear triad, reinforcing its naval component with potential for a retaliatory or launch-under-attack nuclear strike in the case of a global conflict. Even from the mooring berth of the Russian Navy’s Northern Fleet, the range of the missile is sufficient to hit almost any target on the territory of the United States or China. It is precisely this missile capability which, regardless of emerging U.S. missile defense systems and the concept of a pre-emptive global strike with conventional weapons, pushes the prospect of war away from Russia’s borders and allows the country to hold an independent position in the global arena. Therefore, unlike its very warlike predecessor, the modern Bulava fights only in tests, although it has sustained some losses too. To date there have been 19 test firings, eight of which were successful and four partially successful. The last launch, on September 6, 2013 failed due to the malfunction of an extendable blast nozzle. But very much like the Russian mace on the belt of a medieval warrior, though it may seem less fearsome and deadly than a sword or spear, the modern-day Bulava, hidden deep in submarine launch silos, is the guarantor of a counter-strike.